Until I leave for Atlanta. Got confirmation today that I will be able to volunteer at the Reed Sorenson Charity Golf Tournament. It was awesome last year (keep an eye out on days 43 and 42 for more pictures of that day). A beautiful golf course, a beautiful day and lots of Nascar folks. What more could a girl want? Now as to the business of the number 48 there is only one direction this post can go: Jimmie Johnson, 4 time (in a row) Sprint Cup Champion who has the most awesome crew chief in all of Nascar Chad Knaus. Jimmie is a new dad of a baby girl named Genevieve Marie, which makes her GM Johnson, coincidence or not that a Chevy driver would have a daughter with the same initials as his car manufacturer? Congratulations to Jimmie and Chandra. 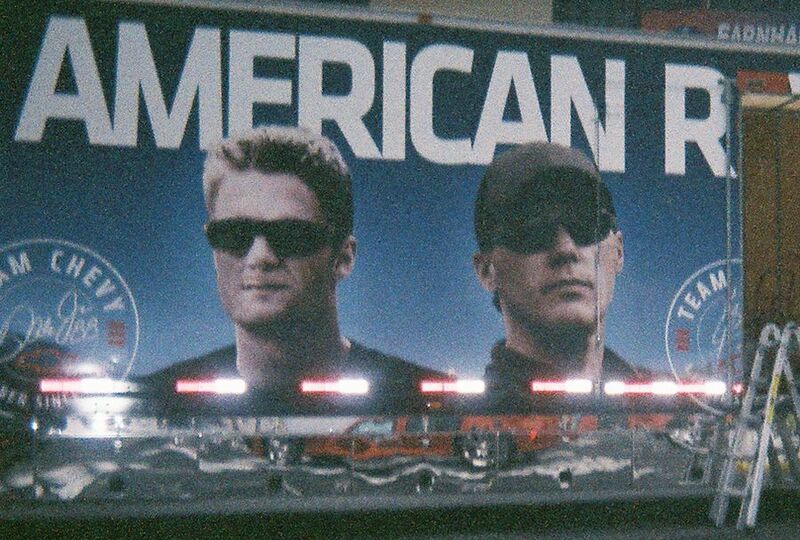 So here’s a picture of the Chevy Truck next to their awesome display at Atlanta Motor Speedway March 2008.
be for Dale Jr. it can’t be easy. Just his name for example, he never gets to be just Dale. He’s Dale Jr., Junior or even worse as Darrell Waltrip says June Bug. He was born having huge shoes to fill and no matter what he does he will always be compared to his father. The expectations are very high. What if there’s a Dale III? Just imagine what it will be like for that kid. Maybe it will take some pressure off of Dale Jr.
Next, I give you Carl Edwards. You don’t have to know much about Nascar to know this is the guy who does back flips after a win, but did you know that this chest and six pack abs are being hidden under that firesuit? Come on ladies, all together now, OH MY. Carl is an amazing athlete. I heard that he’s biked between races before, in the middle of the summer. Rethinking Nascar yet? But wait I’m not through. Not bad huh? He’s an amazing driver to boot. Have to give props here to Chad Knaus (Jimmie’s crew chief for those of you who may not know) who I believe is the most brilliant man in all of Nascar and has much to do with the fact that Jimmie has won those 4 Championships. Jimmie and his wife Chandra are expecting their first baby next month. 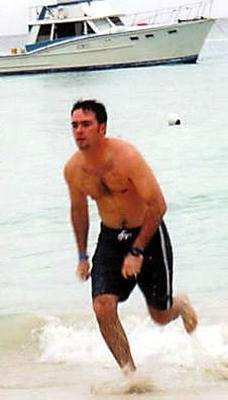 Jimmie was featured on an HBO series 24/7 that followed him the week of the Daytona 500 he has a grueling schedule that includes much time working out, as you can see. Last but certainly not least is my favorite Driver, Reed Sorenson. Reed as you know is from my home state, The Great State of Georgia. Reed is currently driving part time for Braun Motorsports in both the Nationwide and Sprint Cup Series. Reed is currently #16 in the Nationwide series despite the fact he’s only driven in 10 out of the 15 races. Not a statistic to take lightly. Way to go Reed. Hope to see you back full time next year. 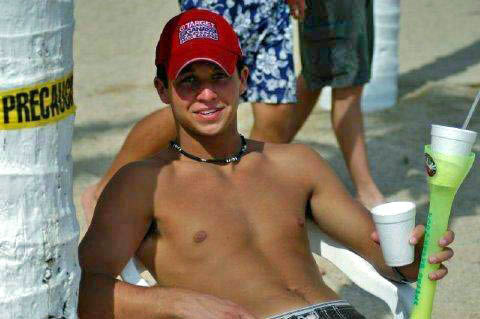 There you have them ladies, the Totally Hot, Totally Shirtless Men of Nascar. Okay we’re three races into the season and Jimmie has won 2 out of 3. It’s just crazy. What do you do though? He and Chad Knaus along with Hendrick Motorsports have got winning down to a science. I think Chad is the most brilliant man in motorsports and cute to boot. So four Championships in a row already and starting the fifth season off like he has it’s amazing. How do other people compete? Can they compete? How long can it go on? At least they are good guys. Jimmie Johnson, all I can say is WOW.